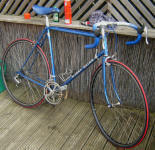 Harry Quinn Cycles was essentially a Liverpool business, although the concern had various locations. For instance, in the mid-1980s, they were on the Ivy Tower Farm, at St Florence, near Tenby Pembrokeshire, Wales. 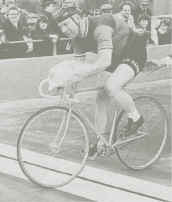 Harry Quinn Cycles began as Coronet Cycles in 1890s. Harry himself was the son of the founder, also Harry, and was then joined by his own son, Peter. The 'Harry Quinn' marque was begun in the 1950s. The racing bikes were noted for their short wheelbase and steep angles, relative to other contemporaneous makes. 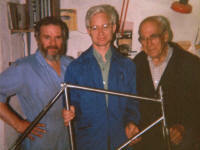 Harry also served as the bike designer for others, including Viking cycles & Falcon. Harry passed away on 1st October 2010, aged 93.
when Harry Quinn was living in Tenby, Wales"
under the guidance of father & son, Peter & Harry Quinn. have been produced to order by an outside vendor. Jim Laird owns this unusual bike, a 49CM "Club Rider" made of Columbus Aelle tubing, #Q928. Purchased from The Tread Mill in Potsdam NY in 1992. 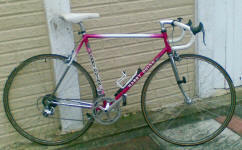 "I was told it was owned by Harry Quinn�s son and part of a fleet of track bikes that he toured the US Velodromes promoting single speed bikes."